"It's funny we didn't cross paths sooner." 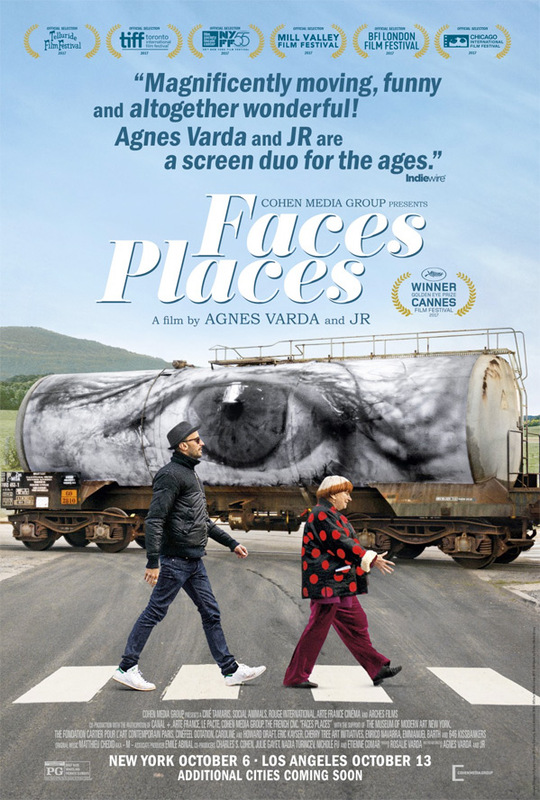 Cohen Media Group has unveiled an official trailer for Faces, Places, a wonderful documentary starring JR & Agnes Varda, who team up for a road trip around France to photograph and talk with locals in small towns about life and love. Also known as Visages, Villages in French, this film premiered at the Cannes Film Festival to rave reviews. It totally won me over, it's one of the most uplifting, inspiring, lovely films this entire year and it made me so happy (here's my full review). Seriously, you'll leave with a huge smile on your face. The way they bring life to these towns just by talking with people and photographing them is heartwarming. I can't recommend this enough, and I really hope it finds a grand audience. The more people that go see this charming film, the better, it'll bring joy to so many. 89-year old Agnes Varda, one of the leading figures of the French New Wave, and acclaimed 33 year-old French photographer and muralist JR teamed up to co-direct this enchanting documentary/road movie. Kindred spirits, Varda and JR share a lifelong passion for images and how they are created, displayed and shared. Together they travel around the villages of France in JR’s photo truck meeting locals, learning their stories and producing epic-size portraits of them. The photos are prominently displayed on houses, barns, storefronts and trains revealing the humanity in their subjects, and themselves. Faces Places documents these heart-warming encounters as well as the unlikely, tender friendship they formed along the way. Faces, Places (or Visages, Villages in French) is co-directed by photographer JR and actress / filmmaker Agnes Varda. This first premiered at the Cannes Film Festival earlier this year. Cohen Media Group will release Faces, Places in select theaters starting October 6th this fall. Go see this excellent film.